Welcome to August 2017's business income report where I show you how I made money online last month. It's time to look at this month's update and see how I did. 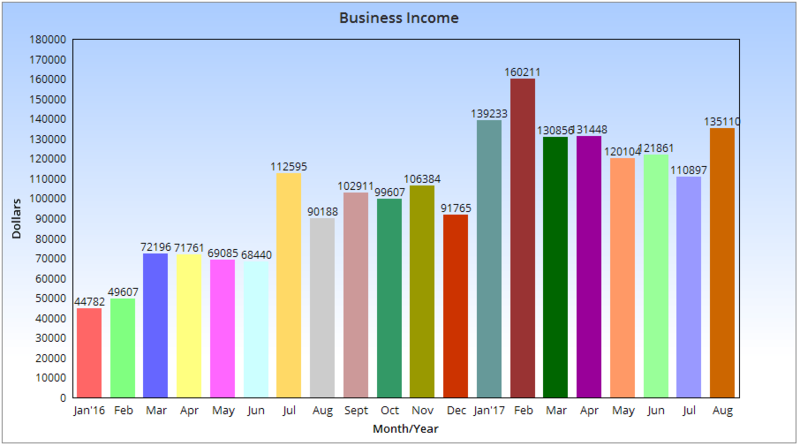 How was business income in August of 2017? 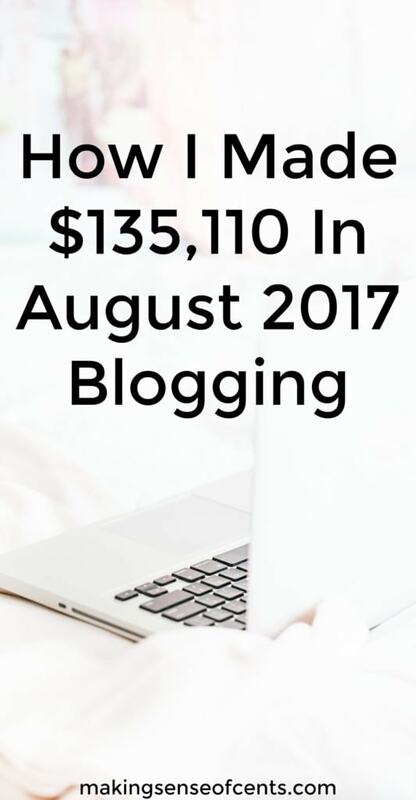 I earned $135,110.19 blogging and online in August of 2017, before expenses. August was a great month for the business. I have been working less than 10 hours a week, and I also had a virtual assistant start in July which has made work even more enjoyable because I now have my VA completing the tasks that take up a lot of my hours each morning. This makes August my eighth consecutive month with income over $100,000. 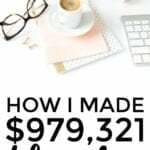 I never thought that I would ever earn over $100,000 a month, especially with a blogging business, and it's crazy to think about how I earned over $100,000 last month alone. I'm focusing on my email list. I didn’t start taking my email list seriously until around April of 2016 when I switched to Convertkit. Convertkit makes sending an effective and efficient newsletter so much easier and better. I never really understood email marketing before, but ConvertKit makes it so easy and now I feel like I’m an expert! I now have over 60,000 email subscribers. One of my biggest blogging mistakes was waiting years to start my email list. If you don’t have one yet, you should start ASAP! I'm spending more time on Facebook. I started 2016 with just around 6,500 Facebook followers and ended the year with 38,000. At the end of August of 2017, I was already at 79,000. I owe a lot of that to the ebook Facebook Strategies Worth Sharing. Growing my Facebook page has allowed me to reach new readers, improve my blogging income, grow my email list, and more. As you can see, August was another great month. It was great on all fronts – blogging, course-wise, life, and everything else. The business is doing well and I'm very happy with it. I've been catching myself saying “Life is really good” a LOT. And, I truly mean it. Life is really good! Miscellaneous affiliates – $3,392.00 (private affiliate promotions that I'm not allowed to share, as well as some small affiliate earnings are mixed in here). The income amount above is for the month of August and before any fees or expenses (some fees and expenses that lower the amount above total around $4,000 (rounded up), which include virtual assistants, Teachable course platform fee, technical assistance, newsletter expenses, PayPal fees, Stripe fees, etc., however, this does not include taxes) being taken out. I also had expenses for the affiliates promoting my course, which totaled $8,012.85. After expenses and fees, I earned approximately $123,097.34. In August, I finally made the switch to HTTPS. Last month, I received a message from Google saying that my website would start showing a “Not Secure” warning on my blog, along with many other websites that aren't running on HTTPS with an SSL certificate. It's a change I've been just passing over and not really thinking about. However, with this new message, I knew I finally just had to get it over with. So, I hired Grayson (I use this genius to complete all tech-related things for my business). He was able to do it quickly, and affordably. I definitely recommend hiring him to complete this very important task for you. I switched from Shareaholic to Social Warfare Pro due to making the switch to HTTPS, so that I could keep my social media numbers. I don't know why I didn't make that switch sooner because I already like Social Warfare Pro 1,000 times more than what I used to have. I'm also in the very early stages of testing out Awin. They are one of the biggest affiliate networks in the world and I recently received an email from them asking me to try them out – so I figured why not? My sister started as my virtual assistant in July and at the time of this writing, she has now been my assistant for almost two months. It is going very well. Some of the tasks she is in charge of are adding Pinterest photos to older blog posts here on Making Sense of Cents, helping manage the Facebook groups I run, scheduling social media posts, and more. This helps free up more of my time so that I can create more products, reach more readers, and most of all, have an even better work-life balance. I finally started a community group for Making Sense of Cents. This is a Facebook group in which you can seek advice from other readers on all sorts of topics such as finance, blogging, travel, running a business, and so on. There are already over 7,000 members! I created a new series on my blog where I interview extraordinary people who are doing interesting things in life. First, I interviewed JP, who retired at the age of 28 with a net worth over $2,000,000. Other interviews I already have in the works include a great debt payoff story, a family (including a baby!) who live in a van full-time and run a business, an interview with Kimra Luna, and more. I'm extremely excited about this new interview series! If there's anyone you would like me to interview, please leave a comment and let me know. I released my How To Start A Blog FREE Course. If you’ve been wanting to start a blog, then check this out. 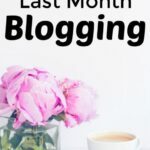 I created this email course for those who are interested in starting a blog, but haven’t done so yet. The course is free, and over 29,000 people have already signed up. Thank you, everyone, for the kind emails about how great the course is. Glad everyone is enjoying it! 7 Days. 1 Challenge. Up to $500 Earned! How We Paid off $86,000 in Debt in 5 Years – with 7 Kids! Featured Question: How should a person come up with a blog name? Deciding on a name for your blog is probably one of the hardest parts of starting a new website. You may know exactly what you want your blog to be about, and you may have even already written a few articles. However, the blog name may be stopping you from actually creating your website and launching it. Coming up with a blog name doesn't have to be impossible, though, and it doesn't have to lead to stress. I still don't know how I first came up with Making Sense of Cents, but I'm glad I did. It is still catchy to this day, and I even still receive compliments on it. Make it easy. My blog name isn't the easiest for a person to spell, and even I sometimes jumble it when I'm spelling it to someone. So, my top tip would be to make sure that it is easy to type. I've seen blog names that are extremely long, contain words that are difficult to spell, and so on. Instead, you should make it as easy as possible for your reader. Think about what you'll be writing about. You should think about the topics you want to write about on your website, who your target audience is, and more, and jot down descriptive words that are related to what you want your website to be about. Brainstorming this way can help you to think of a blog name! Use a thesaurus to think of similar words. Sometimes, your first choice for a blog name may not be available, or perhaps you want to see if other words catch your attention better. A thesaurus can make this task easier. Make it catchy. You may want to think of something funny, use alliteration, or something else to make your blog name catchy and memorable. Use your name. If you don't want something catchy and/or if you think you're not creative enough, then just use your name. It's super easy that way, and more and more people are starting to do this. Creating a name for your blog is easy, see! I'd love to hear about how you came up with your blog name. Please share in the comments below. Earn $1,500,000 from my business in 2017. This is a new goal that I just adjusted for 2017. Many of you have asked why I didn't increase my goal to $2,000,000 for 2017 since I was so close to $1,000,000 in 2016 already. Well, the main reason for that is because my overall goal for the year is to have a better work-life balance, and, instead, earn more passive income from my blogging business. BUT, after looking over my June income report, I have realized that I was very close to this goal for 2017 already, so I increased it. My goal for 2017 is to now earn $1,500,000. It will be a tough goal, and I look forward to beating it! I've changed it a few times this year now after tracking my progress – a task I recommend because it can keep you motivated to succeed with your goals. Be around three months ahead on Making Sense of Cents posts. I am currently only around one month ahead in content. I fell behind due to me being lazy this summer. I would like to be around 3 months ahead in content. Being ahead in content makes life much more enjoyable because I can focus on other things knowing that the majority of my writing work is already done. Grow Making Sense of Cents to 1,000,000 monthly page views. I would love to help more readers, see even more engagement, have higher traffic, and so on. I love my blog and I would love to see it grow! I’m hoping to see around 1,000,000 monthly page views by the end of 2017. I do not see this happening this year, but I have been able to significantly grow my email list which makes me very happy. Do as many live interviews as I can, such as podcasts and webinars. I’m not as shy as I used to be, but living in an RV and not always having internet or a reliable schedule makes podcasts and webinars a little more difficult. I hope to find a way around that (perhaps planning out a better schedule?) and dedicate more time to this area. In the last few months I have completed several podcasts and video interviews. I am planning on taking most of September and October off though to dedicate more time to travel and living in the present. In August of 2017, I earned $46,198.19 in affiliate income, as outlined earlier in this blog income report. August was another great month for affiliate income and I didn't spend more than one hour on my affiliate marketing strategies for the whole month. Instead, it was nearly 100% passive affiliate income (which is my favorite form of affiliate income) and reliant on old content here on Making Sense of Cents. I only published one affiliate-related blog post in August (and it was written months before). My affiliate marketing course went live in July of 2016. I've already had over 3,100 people purchase the course, and I'd love to have you as a student as well! How was August for you? 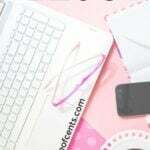 Are you interested in earning blogging income? Congratulations Michelle. Your course accounts for more than 40% of your income. I also made the switch to HTTPS. I am on a shared server so it was easy to install by clicking a button and redirecting links. Yes, course income is increasing – it’s crazy to see that! That’s an awesome month! Yes, very much interested in blogging income. I’ve been blogging for a couple of months, and have done pretty well so far building up traffic. 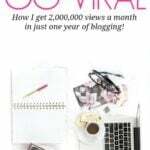 But I would love to start earning some type of income from the blog too. Picking a name…. that was one of the hardest parts for me. Plus, I probably didn’t pick a very simple one, although it defines what I write about. I def recommend following your tips to make that process simpler! I keep seeing blogger switching to https, so I am thinking I need to look at that now…. may be on my blog to do list this month. Thanks for all the tips! Yes, one of the top questions I receive is about how to pick a name – I don’t know why it took me so long to finally make the blog post! Michelle, I always love reading these. You continue to be an inspiration! Thanks for sharing. Congrats on a successful month of blogging. You are an inspiration to us all. I’ve heard a lot about https. I think I need to do that too. Thanks for the tip! Extremely detailed and concise blog post, well written and enjoyed the read. Keep up the good work my friend! I’ve been reading your blog for a while, but somehow I always missed the income reports. When I clicked the title I was like… hmm you mean $136 or $1360, like something isn’t right :)? I’ve been blown away about what you wrote, I didn’t believe that such numbers could be generated from a single blog. How many unique visitors are usually reading monthly? Can you share some of the users stats and bounce rate? I share the monthly page views every month in my income reports. Unique visitors are somewhere around 300,000 a month. I don’t really track my stats too well. Yay for making positive strides toward work-life balance. 🙂 The HTTPS thing is annoying; I just made the https switch myself. But whatever works! I always enjoy reading your income reports. Gives me inspiration. My blog is still a baby and is very slowly gaining ground. Need more subscribers. Really need your course on Affiliate Marketing. I also switched to https. Grayson helped me as well. He is really great to work with. Thanks for sharing and always being an inspiration to others. Congrats on topping $1M for the year – I’m sure you’ll hit your $1.5 goal! Getting lazy and now only a month ahead isn’t that big of a deal! After all don’t you want to enjoy the fruits of your labor a bit? 🙂 A month ahead is still great! I’m like…a week ahead. Haha yes! You are right. Great job on the much-deserved financial success behind Making Sense of Cents! As for blog names, well, you may recall I just went through a rebranding effort – changed the name of my blog and created new social media channels around the name. My wife and I brainstormed for several days, and in the end the only thing I was confident in was I wanted something around the word “money.” I’d previously created blogs about “debt” and “frugality,” but this time I wanted a broader focus. Aha! Simple Man Money was born. 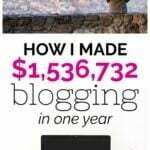 Congrats on your success and it’s nice to see how your blog just keeps increasing in revenue. It definitely goes to show that your hard work that you put in advance, is paying off. That’s definitely nice to know as a blogger. Congrats on making the switch to HTTPS. I made the switch about 3 months into starting my blog. I didn’t want to deal with the headaches later when I had a lot more traffic. Sounds like your transition went smoothly. I’m using Social Warfare Pro as well. It’s a great plugin, I love it. But it’s really the only social sharing plugin I’ve used since starting my blog. Thanks for sharing your income report with us, it’s definitely motivational to see where you came from. Congrats Michelle! You are such an inspiration. Thank you so much for touching my life, I’m beyond glad I found your blog. Keep shining and stay blessed! Wow you’ve already made a million dollars this year!! That is remarkable! Well done! Wow, 29,000 have already signed up for the free course. That’s great. I need to make the switch to Https. Thanks for the reminder. Wow so inspiring! Thanks for sharing all this! I find your reports to be so helpful as I continue to build my blog. I hope to one day be successful with it. I had to double take when I first saw the income figure! Huge congratulations and such an awesome and detailed post. Creating your own products is definitely the way to go. Thanks for sharing this and inspiring many thousands of bloggers. Yes, creating your own product is so important. I love reading your income reports. They are super inspiring! I have just purchased Social Warfare Pro, I cannot wait to try it out. I have heard so many good things about it. Surveys Companies: Do you do all the surveys yourself? How many surveys do you do a month? About a VA: When did you decide that was time to hire a VA? Also what task does she do for you? Thank you so much for sharing amazing information! Definitely will apply all in my business! 1) If you look again at my income report, you’ll see that survey income is listed under affiliate income. 2) I list out the tasks she does in this income report (or maybe it was the last one). Definitely recommend reading that as it’s a long list. I wasn’t sure about moving to https. I believe I already have one, but not sure if it’s transferable? I need to start reading your blog again more often, because I get really motivated and I kinda lost track of myself over the summer. I have no idea. HTTPS is over my head, haha. 1 thing I learned about https:// is that it does significantly help boost your long-term search engine rankings and safeguard your site from hackers. When I used to run my website in the recent past and Google Chrome, Google would tell me that my site is not secure. Like Michelle and other people, I too didn’t know what https:// was and had to look into it further on my server for installing the SSL certificate. Now that the SSL certificate it is uploaded and secured and https:// intact, it not only helped boost my SEO in a short time as previously mentioned, but also helped to increase my online trust score & positive reputation. Congrats Michelle. I am too using shareaholic and wanted to move my site from HTTP to HTTPS and asked the sales person at social warfare if they would be able to recover FB shares. They replied that “Unfortunately Facebook has changed its share API to make recovery impossible”. Are you absolutely sure that you have recovered your share counts especially Facebook shares? If you look here – http://www.makingsenseofcents.com/2015/05/75-ways-to-make-extra-money.html – it is listing the Facebook shares in the thousands so I am assuming yes. I love hearing all about your success. Keep doing what you’re doing. You’re an inspiration to us all. I love your site and am enjoying learning from you! Thank you so much! I am at the very beginning of all of this at the age of 67! What please is HTTPS? I am not tech savvy, but I long to do what you have been doing and I will try to find my way. For someone of my age, with no background in any of this, am I better off with a WIX website or a Word Pres.org with Bluehost? I want to get into affiliate marketing too. Why? Where did you find Grayson? I need a Grayson too…. desperately! I definitely recommend WordPress.org than Wix. Almost everyone I know who tried Wix first ends up switching to WordPress and it’s a big hassle. It’s still hard to believe that I stumbled across an income report of yours way back in Feb 2016 and it gave me to push I needed to start my own blog. I retired my hubby from his job twice, lost my granny, made more money per month than we have in our lives (but I was more stressed and depressed than ever), and so much has changed in my business since I started. Like you, I realized my work-life balance was way out of whack, and I’ve completely turned my business upside down to rebuild and recreate something that doesn’t leave me in a constant state of burnout. It’s not easy letting go of old habits and mindset, but how things were going for Bringing Home Becker wasn’t sustainable for us and our three little ladies. What Laptop Model have you found to be the best platform for working on your blog, social media sites, daily work and interaction with followers, etc. How many different laptop models have you tried? Sorry if you have already stated this previously. Thanks for all the knowledge, guidance and inspiration that you freely pass along with your blog. I have been following you for a while now and it is definitely inspiring to read your reports, plus I always learn something new as well. Congratulations on another great month! This is the kind of thing that makes me pinch myself after reading. U am not trying to compare, just that it reminds me of the opportunities that are there in blogging. I am super inspired by all the work you have put in. It’s amazing how passion can really drive you to achieve unbelievable and amazing results! Thank you for being honest with us, really appreciate it! Hi Michelle! Love your blog and it was your blog that inspired me to actually start a blog. I was wondering if you know the gender statistics of your followers? Are they x% woman and y% men? This is amazing! Hope you make much more in the future, thank you so much for sharing.